It is no accident that federal crop insurance works like a lottery. The Federal Crop Insurance Act that Congress passed and repeatedly amended creates the very conditions that lead farmers to view crop insurance more like a lottery than a risk management tool. The reason a farmer can expect a positive rate of return from a crop insurance policy is because the government picks up a large share of the cost of the premium. The Federal Crop Insurance Act specifies how much of the premium the government will pay. The subsidy rate varies with the coverage level a farmer chooses. 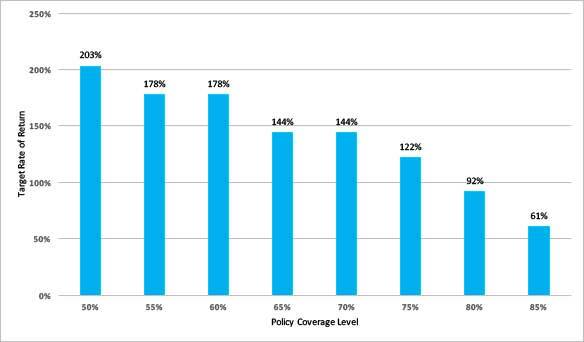 In general, the premium subsidy percentage decreases as coverage levels increase (Table 2). USDA’s Risk Management Agency (RMA) establishes the premium for a policy at an amount that, over time, should cover all the payouts from that policy. Farmers, however, pay less than that amount of premium, thanks to the subsidies. This is why farmers can expect to make money buying crop insurance policies; they are paying less than the amount of payouts RMA expects to make on that policy. The percent of the policy premium paid by taxpayers essentially determines the “target” rate of return – the rate of return a farmer can expect to enjoy by buying the policy. For example, if the true premium for a policy is $100 but the farmer only pays $50, then over time, that farmer can expect to get $100 in payouts, a target rate of return of 100 percent. A subsidy rate of 50 percent, in other words, implies a target rate of return of 100 percent. The target rate of return declines as the coverage level increases and the share of the premium paid by the government decreases. The target rate of return on a policy for which taxpayers pay 67 percent of the premium is 203 percent. That target rate of return declines to 61 percent if taxpayers are picking up 38 percent of the cost of the premium (Figure 3). Since 2000, most farmers have chosen policies with coverage levels between 65 percent and 75 percent, which are subsidized at 59 and 55 percent respectively. This means the crop insurance program overall is targeted at providing an average rate of return on the farmer-paid premiums of 120-to-140 percent. It is apparent from Table 1 that outside the Corn Belt the average rate of return since passage of ARPA has been higher than this target, but inside the Corn Belt it has been lower. The overall average rate of return from 2000 to 2014, calculated using the data in Figure 1, has been 124 percent, which is not too far off from the target. This suggests that Corn Belt premiums have been set at relatively higher levels relative to payouts than in non-Corn Belt areas. Clearly, ensuring that farmers have a good chance of getting back more in claims than they pay in premiums is baked into the design of the federal crop insurance program. The target rate of return assumes that unsubsidized premium is exactly equal the average insurance payment received. Thus if the subsidy is zero, the target rate of return is 0%. In recent years enterprise unit coverage has become more popular with farmers, particularly in the Corn Belt. Under enterprise coverage all land planted to a single crop in a county is insured together, rather than each farm being insured separately. Premiums for enterprise units are more heavily subsidized with subsidies ranging from 53% at a coverage level of 85% to 80% for coverage levels of 70% or lower. These subsidy levels correspond to target rates of return of 113% to 800%.